Zhong Cheung (ZC): My car is a Graphite Gray 2006 Mitsubishi Lancer Evolution IX, which I acquired in Aug ‘06 with only 6 miles. It is now knocking on 90,000 miles. Over the course of my 7 years of ownership, I started modifying the car slowly with basic bolt ons and suspension from 2007-2009, but in mid 2010 that all changed. The OEM engine took a dump after 15-20 track days. I never could have imagined how much development and modifications would go into the car since then. Didn’t think I would be in this deep. JR: Uh-oh, better hope your girlfriend doesn’t see this! So, what’s your all-time favorite track and direction (CW, CC) that you’ve raced? Why? ZC: My favorite all-time favorite track has to be Circuit de Spa-Francorchamps in Belgium. Three miata buddies of mine and I decided to go on a little car vacation/ adventure to Germany and Belgium to just check off a few things off our bucket lists that every car enthusiast must do. One of them being, go and drive at one of the most famous and prestigious tracks in the world: the Nurburgring and Spa-Franchorchamps. So much motorsport history is contained here and it really is every car enthusiast’s dream. Our first day at Spa-Francorchamps was pure luck as it was completely un-planned. 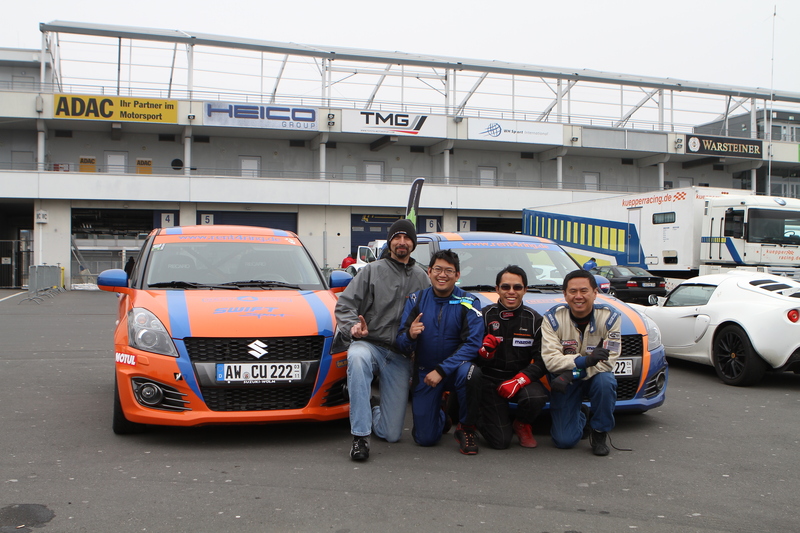 Initially, it we were planned to drive on the Nurburgring, but it got snowed in. So, we decided to take our BMW 320d rental to do some sight seeing and see if we could just look at Spa-Francorchamps, since it was only 1.5 hours away. We didn’t bring any of our racing gear whatsoever and just in our regular clothes. Somehow we ended up at the track and were able to arrive and drive for just $75/person. Incredible. We took turns doing lap after lap 2 by 2 in our rental until the day was over. We ended up coming back the next day with a proper car, a Lotus Exige S that we rented from RSRSpa in Nurburg and had a blast. The track is so surreal, as the track was located within the Ardennes Forest between small Belgium towns. The fact that we were driving on a Formula 1 track was a dream come true, and it was truly a real driver’s track because of the nature of the terrain. The track is always evolving due to quickly changing weather conditions. The circuit is fast with free flowing connecting turns, with many elevation changes to fast sweepers and kinks, to tight hairpins and chicanes that make it enjoyable to drive and really challenge the driver. 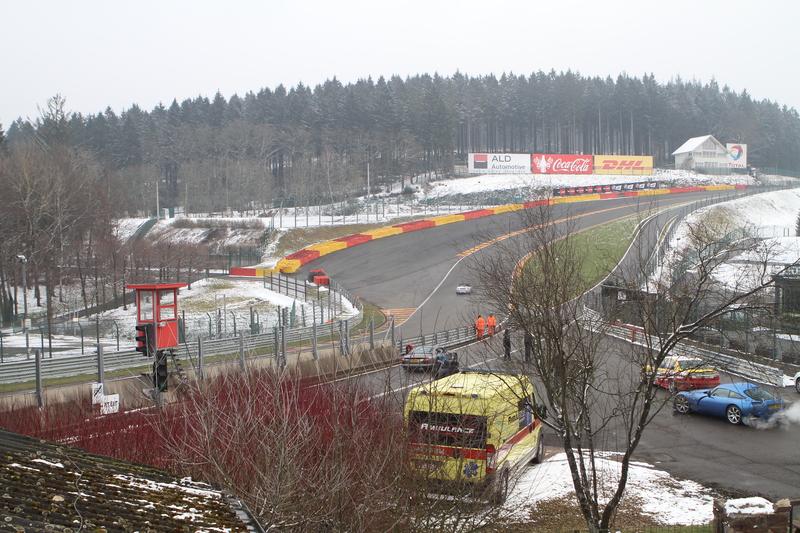 My favorite turn out of the entire track is Eau Rouge. It is absolutely exhilarating, iconic, unforgettable in the way you drive towards it, as well as the feeling you get when negotiating it. Socal tracks have nothing on this track. The facilities were equally amazing. I was simply mesmerized knowing how many of great drivers in motorsports have driven here. JR: What an incredible experience. Now for the opposite end of the spectrum, what’s your scariest on track moment? Any safety recommendations you would make to other drivers from this? 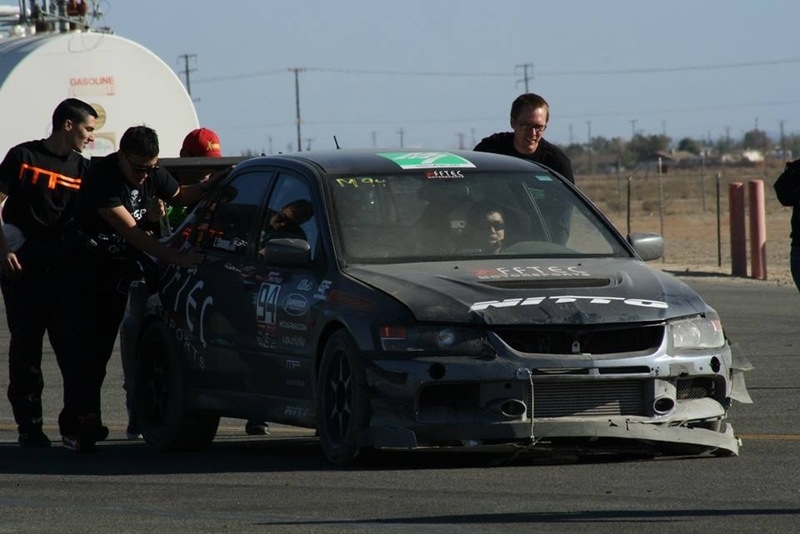 ZC: My #1 scariest moment would have to be blowing my engine entering Turn 9 at Willow Springs International Raceway at round 7 at Redline Time Attack. I was going around 110-120mph when the bearing seized/and rod let go out the bottom of the oil pan. I Instantly got 40deg sideways from the oil dumping in front of my tires. At the same time, I could see flames coming out from under the hood from behind and from the vent. I knew it had to be oil touching hot parts in the engine, making it an oil fire. I was counter-steering for a good 3 full seconds trying to get it to go straight and not go off sideways. Luckily, I ended up going off straight at about 90mph after running out of track as it is a decreasing radius turn. I didn’t know at the time, but my exhaust also caught the oil on fire and shot flames a good 10 feet behind my car. The rear end panels got scorched, but didn’t turn black or anything. It pretty much turned the paint to a nastier color and cracks can be seen. Let’s get back to my incident. As I was going sideways, I was running off all the things I needed to do when the car does come to a stop and if I was still conscious. I told myself undo belts, release hood release, unlock doors, get out with helmet and HANS still on with my OEM steering wheel with high side bolster buckets seats and halo surround, run over to passenger side to get the fire extinguisher. At this point, I was going through hay bales (luckily) and the 2nd row of hay bales, the car came to a stop. All the while I was applying brakes the entire time to get the damn thing to slow down. Once out of the car and got my hands on my recently installed fire extinguisher, I pulled the pin, unlatched the hood, propped the hood while accessing where fire was coming from. I concentrated the 7-8s of spray that I had as close as I could to the base of the fire. Got 90% of it out and that’s when fire rescue arrived to put out the last bits. So, I bought myself some time for sure with my fire extinguisher and quick thinking. The scariest part of the incident was the moment I went off the track, knowing there are ditches and a solid green wall about 75yards on the perimeter of the tracks surface. I was spared carnage crunching metal as I really did halt abruptly after contacting the 2nd row of hay bales. There was a 6in ditch when I hit the 2nd set of haybales. Luckily enough my splitter saved my underside of car and front side of car from damage. It was unfortunate that my motor blew and my camera wasn’t running, as the battery was dead during that session. I was bummed about that. 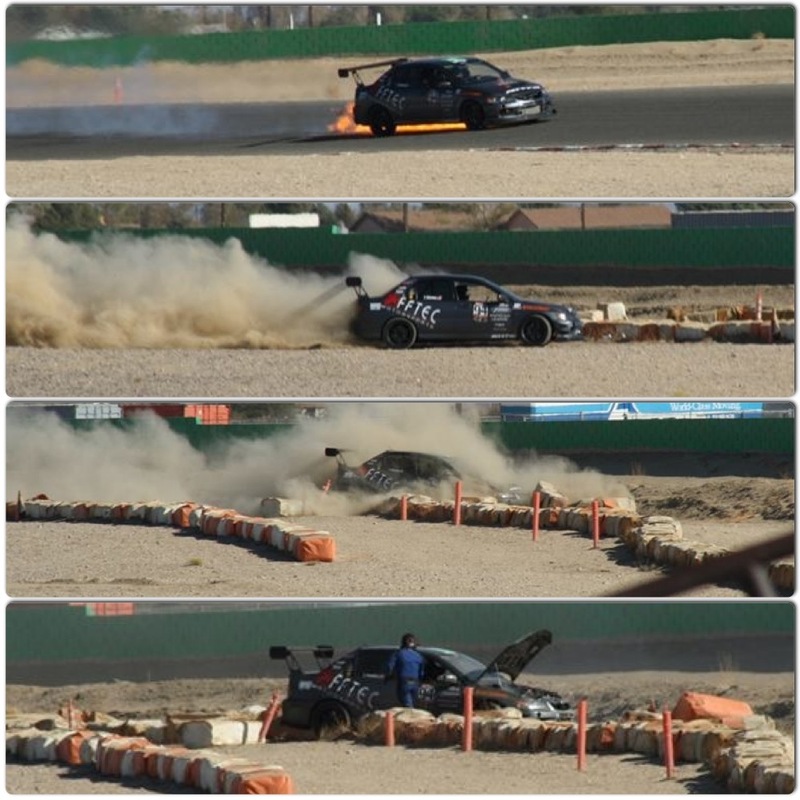 At the same time, I am extremely fortunate that the carnage could have and should have been much worse with high possibility of rolling the car and hitting hard objects and injury to myself. I would recommend any driver who takes tracking seriously to concentrate their money on safety equipment like: 3layer fire suit, SFI gloves, SFI balaclava, SFI shoes, SFI socks, HANS, minimum rollbar, or a NASA/SCCA certified 6pt rollcage, bucket seats with HALO, quick release steering wheel, 6pt harnesses, a minimum 2.5 or 5lb fire extinguisher or a carefully routed and installed fire suppression system. You can also add window nets/center nets/side crash bars if you are serious and want to go racing. JR: Glad everything turned out okay for you, Zhong. Which event are you most looking forward to this season? Any records or other competitors you are looking to demolish? ZC: Actually, there are two: Super Lap Battle at Buttonwillow Raceway and (pending funds, logistics, and able to get time off) Road Atlanta with Global Time Attack. I am just looking to improve my time and hopefully able to compete for podium positions in my class. In regards to Road Atlanta, I have never been there before, so just have fun and learn the track without going too crazy would be my plan. If I can beat cars/drivers that I haven’t beaten before, then that is cool too. JR: Do you have any good luck rituals you do during the season or before a race? ZC: Not really. I just try to relax and concentrate on what I need to do while sitting on grid. Sometimes the night before I sleep, I close my eyes and visualize myself driving the track. I also watch and re-watch in-car videos of places I am about to go in the week leading up to the event. ZC: There definitely needs to be more coverage by magazines, media, blogs, and independent filmmakers to bring more awareness and promoting time attack. Also, not just promoting and advertising in your typical outlets like Facebook and word of mouth, but really reach out to the different car culture/communities to engage them. This in turns gives sponsors what they want, which is eyes on their logos and return on their investment. Also with more people interested means more competition and this benefits everyone involved. It raises everyone’s competitive spirit and makes us work harder and set higher goals. Higher stakes and prizes would be a huge plus to give back to the competitors who supports the time attack series. As everyone in the time attack scene will tell you, we all spent a lot of time and money to make it out there and want something to show for it if we do podium or win. JR: Thanks a lot for sitting down with us, Zhong. Best of luck to you this season! ZC: Thank you for this opportunity and it has been a pleasure sharing my experiences with The Driver’s Seat.